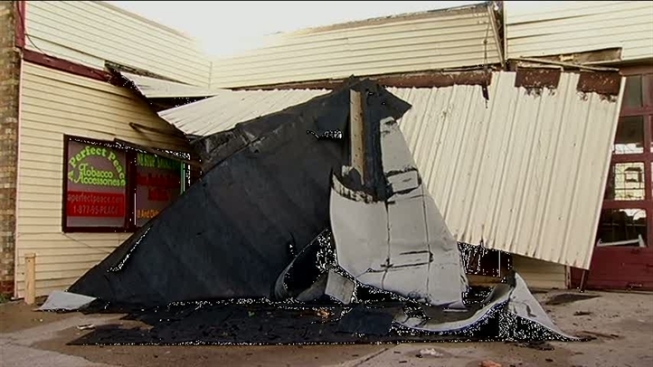 Overnight storms wreaked havoc on businesses and homes in Waxahachie. As strong winds tore down trees, power lines and billboards, some found themselves without power. "Next thing I know my electricity was gone and that was the end of that. We been in the dark since 1 something this morning," said Tyrone Neveu. And Neveu is not alone. Many guests at the Comfort Suites found themselves waking up in the middle of the night after one side of their building came tumbling down to the hotel parking lot, while they were sleeping. "Wow. I heard the winds, it was raining pretty hard and it was just amazing," said one guest until he realized just how dangerous the storm was, "I was looking for a tornado and I was looking for a place to duck." Police reported more than a hundred trees were down, dozens of power lines fell and the doors of some businesses flew off the handle and into roadways. Across the city the damage was widespread including residential neighborhoods where some people who lived there spent the morning cleaning up debris and picking up pieces of fallen shingles from their roofs.